(Malay Mail) KUALA LUMPUR, June 3 — Malaysia has to free itself from the constraints of “crony capitalism” and stop racial and religious rhetoric in order to compete on the global stage, business tycoon Tan Sri Francis Yeoh said today. The group managing director at YTL Corporation and eldest son of founder, billionaire Tan Sri Yeoh Tiong Lay said 85 per cent of YTL’s business are in Britain, Singapore and Australia because these countries do not tolerate corruption, practice meritocracy and stand for the rule of law. “For example in Singapore, we own a third of Singapore’s electricity, there is no subsidy of any kind, there is no cronyism of any type. “The good thing about these three territories, I don’t have to kowtow to the prime minister before I do deal(s), I don’t have to see them even, even after I’ve won the deal. “I turn west because of this transparent, coherent regulatory framework,” he said during Pemandu’s Global Malaysia Series at the Securities Commission. Yeoh said the country’s leaders have to get rid of all racial and religious rhetoric, and focus instead on the economy to improve the lives of Malaysians. As far as non-Bumiputera small and medium enterprises (SME) go, he said they “absolutely have no chance” to even fight “for the crumbs” as they are already at the low end of the food chain. “I don’t think you’ll have a chance. Even in Petronas contracts, if (you are) a non-bumi you won’t get to do anything, for example,” he said in response to a question from the audience. Yeoh said the SMEs would have to rethink their business strategies, be innovative, and use more technology and try to get global exposure. “Like me, I had to survive so 85 per cent of my business (is) outside, I had to invent a lot of the stuff, for my own self-interest, to make sure I survive. “I don’t depend on the largesse of the government. I can’t, SMEs more so,” he said. 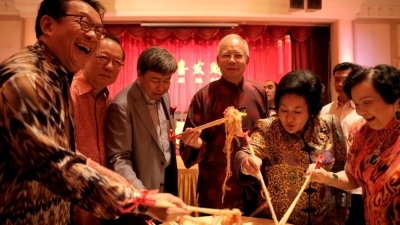 Despite that, Yeoh said it is up to the prime minister to do away with “crony capitalism” for the future of the country. “I think this crony capitalism stuff has to go. It’s 20 years old this idea, I think we should replace it with new, fresh, truthful idea. “Now Malaysia demands a leader in Najib… to really be a Churchill, or be a Tun Razak like his father,” he said. When asked about how his “close links” with former Prime Minister Tun Dr Mahathir Mohamad had contributed to YTL’s successes, Yeoh denied being the latter’s “crony” and credited the company’s achievements to “innovation”. “At that time… I think up till today, almost 21 years later, people still think I’m a crony of Mahathir’s. “People think I’ve got a very fat, lucrative contract from Tenaga, [but] I think it’s about time the truth comes out that we actually were very innovative,” he said. The 59-year-old said when Dr Mahathir introduced YTL as the first independent power producer (IPP), the then prime minister had already been pushing for privatisation. Yeoh claimed to have given the idea to Dr Mahathir after the major national blackout in 1992. “We made profit from day one by this incredible innovation of inventing the bond market, inventing IPC (infrastructure project company) listing, financing it in ringgit that indirectly made Malaysia able to withstand financial crisis,” he said. Washington Backs Egypt’s New Dictator – CATO INSTITUTE…Shame on U Obama! Words r Cheap! Really Francis Yeoh? You were a crony of mahathir. IPPs were ‘created’ to make billionaires of mahathir’s cronies. (Ask Tan Sri Ani). Now that you out of rosmah’s circle, you talk different. While i support the ideas of Francis but can his suggestion really be implemented ?Otherwise how else can the Umno schmucks become millionaires ? Above all how come this country is so heavily in debt and in deficits especially when the country is presently blessed with black gold coming up from the ground or should I say Malaysia is on the road to bankruptcy ? Do not forget the black gold don’t last forever, just like Indonesia, even Saudi Arabia with its gigantic reserve will one day run out of it. I can only see darkness in the air right now for Malaysia under the administration of these Umno schmucks. The only way out of these shambles is to have these Umno schmucks and all the running dogs kicked out of Putrajaya soon and very soon ! And when it does come not all the billions the son of egregious Mahhthir or the US$44-billion the mamak has, can save this country, that they have. Kick them out while there is still a little time left and most of all not even the GST (Goons Survival Tax) will not save this country from bankruptcy but one thing s=for sure the Umno schmucks will not only get richer but will not be around to face the consequences ! “BLACK OUT” 1992 PREMEDITATED 2 PAVE WAYS OF MAHTIHR’S CRONIES IPP ! SAID ANI ; A TREACHEROUS ACT ! KU LI REMARKS AUTHORIZED PERSON DISCLOSES UMNO DIRTY POLITICS ! !